Yesterday I told you about a couple of different methods of saving/preserving basil for the winter. Of course, the most common way to preserve basil is what we’re going to talk about today – pesto! Regular pesto is increasingly common and is pretty simple to make. The basic ingredients are basil, Parmesan cheese, olive oil, nuts (pine nuts, almonds, or walnuts, usually), salt & pepper, and fresh garlic, if you like garlic. You blend them all up together into a paste in whatever proportions tickle your taste buds. You can find tons of basic pesto recipes out there in the world of the Internet. Here’s our basic pesto, chopped basil on the bottom, chopped parmesan and garlic on top. The nuts weren’t in the bowl yet in this picture. (Okay, in a perfect world, you would just throw everything into your food processor all at once, blend it up, and be done with it. Our food processor is a mini…so making things like pesto takes WAY too long!) 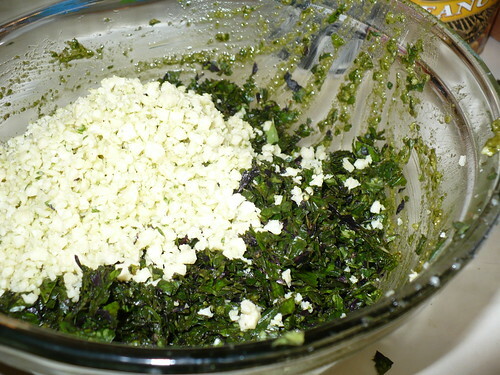 After it’s all chopped up and mixed together, you should taste it and then add salt, pepper, and more garlic to taste. The Parmesan cheese is salty, so taste first! We also had a whole bunch of Thai Basil to use, and we wanted to try something different. We ended up making an Asian-inspired pesto. You can definitely see the difference! Of course, the Thai Basil automatically gives it a unique spicy-sweet tang, and we added 3 dried Thai chilies from the garden, some garlic, lime juice, a little fish sauce, peanuts, salt & pepper, a little sesame oil, and olive oil. When we tasted it, my husband said, “It tastes like Thai (food)!” It will be a lot of fun to find ways to use this pesto this winter. 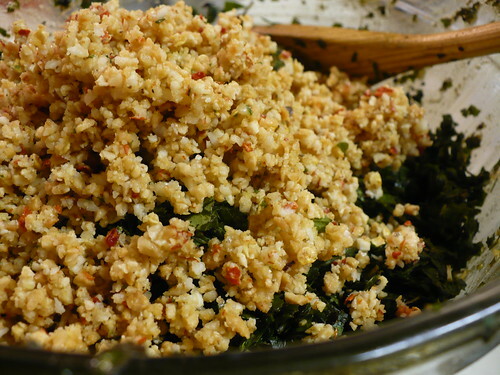 You could also add lemongrass, mint, cilantro, and probably soy sauce for variation. You probably notice that there are no finished pesto pictures. There’s two reasons for that. 1) The only finished pesto pictures I took are blurry, and 2) finished pesto just looks like green glop. Yes, it really does. At least it tastes great! Posted on October 28, 2010, in Around the Garden, Harvesting & Eating and tagged basil, cooking, harvest, herbs, preserving. Bookmark the permalink. Leave a comment.